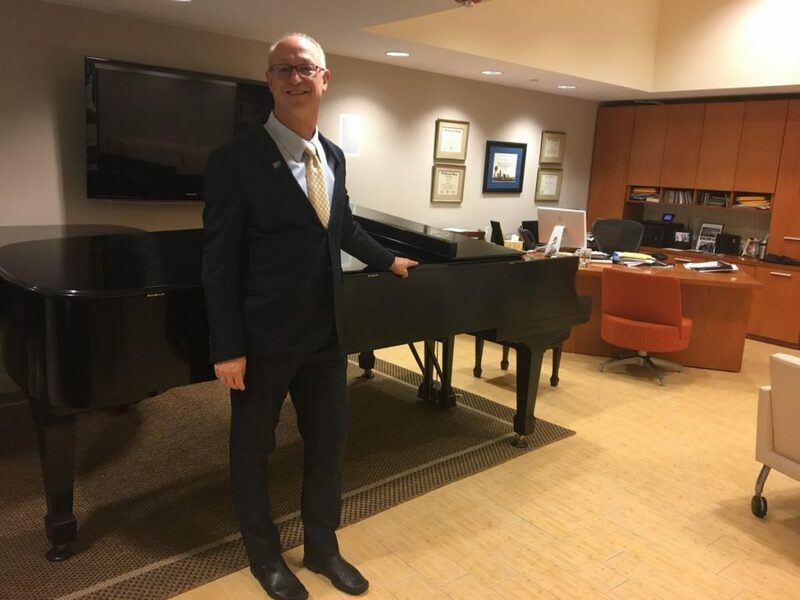 Dean of the Frost School of Music, Shelton G. Berg, was named a 2017 Knight Arts Champion and awarded a $10,000 grant for his Donna Shalala MusicReach Program. The Knight Foundation supports art projects that benefit communities in areas such as South Florida; Akron, Ohio; Detroit and St. Paul. TMH sat down with Berg after the winners were announced to find out more about his program and how it benefits our community. TMH: What is this program about? Shelton G. Berg: The Donna Shalala MusicReach is something that we launched in 2008. And the reason why we started it is because the research, in my experience, has shown that nothing keeps underserved kids and at-risk kids in school succeeding and heading toward college and success better than hands-on music making. Our university’s music school is sort of an army of 750 students. We have all the faculty, we can do a lot if we get engaged. So the first year we helped 12 kids, now we help over 700 kids a year – we’re with them several times a week, 12 months a year, so we’re really part of their lives. We have kids from about third grade all the way through high school in different programs, whatever fits the best need for that location. Then we do a lot of one-on-two mentoring. So a freshman flute player might adopt two sixth or seventh graders, who want to play flute, and then stay with them every week for four years. They develop a real relationship. TMH: What was the main inspiration to create this program? SB: I used to work at the University of Southern California. USC for a long time has had a commitment to be of service to the surrounding community, and it’s worked out very well. And so, as a chair of the Jazz Department, I thought, “Well, I can be a part of the service. Why don’t I start something?” So we went to some of the local schools and we started Jazz Band programs. And we had more success than I imagined with these kids. So when I came here I thought, “Well, I’ve seen how this can work with a Jazz Program with 50 students, what about a music school with 750 students?” And so it was a no-brainer for me. TMH: Why did you decide to apply for The Knight Arts Challenge grant? TMH: So what are you focusing on right now? SB: To continue work with Miami-Dade schools and to go into schools where they don’t have a music program anymore, and to help them bring the music program back. What we hope is that we want to stay there forever because music is important. All the people that have graduated our MusicReach Program have gotten to college. One hundred percent. TMH: What are your goals? SB: I think an important goal is that this is a replicable model. There are lots of university music departments and music schools, and I hope that what we do will help inspire other schools. It already has, in fact. Another foundation gave us a grant to train another school in North Carolina to do the same thing, and now they have a program. And we worked with FIU, and they have a program. So I think my goal is to be an advocate for the replication of this model because it will transform communities. TMH: How many people are involved in the program? SB: Forty to 50 students in the school who are mentoring. In 10 years, we’ve mentored over 4,000 kids, and that number really is going to start to grow exponentially because it’s so many more per year now. We know the benefit that we’re having on the kids that we work with, but equally important is the way it changes the lives of our own students. When they see the difference that this kind of activity can make, it will change how they go into the world and how they view what kind of differences they can make. So I think that’s also fantastic. Undergraduate mentors receive a $5,000 scholarship per year to mentor two children weekly. Students who would like to learn more about Donna Shalala MusicReach can contact Director of Outreach Melissa Lesniak, m.lesniak@miami.edu.